Shop online for 169 aoshima plastic models at discounts up to 22%. Cars / Trucks / Vehicles is the most popular of the 6 aoshima plastic models categories, then Parts/Acc., and Ships. This is the 1/24 Scale Kranze LXZ 19'' Tire & Wheel Set (4) from Aoshima. 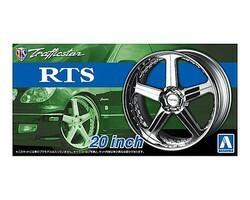 This is the Traffiicstar RTS 1/24 Scale 20'' Tire & Wheel Set (4) from Aoshima. This is the 1/24 Scale SSR Werfen GT03 20'' Tire & Wheel Set (4) from Aoshima. This is the 1/24 Scale Watanabe 8-Spoke 16'' Tire & Wheel Set (4) from Aoshima. This is the 1/24 Scale Suzuka Brain Longchamp XR4 16'' Tire & Wheel Set (4) from Aoshima. This is the 1/24 Scale SSR Professor SP3 19'' Tire & Wheel Set (4) from Aoshima. 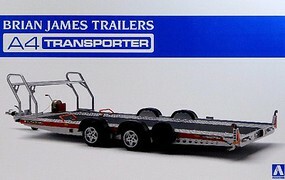 This is the 1/24 Scale Brian James A4 Transporter Trailer (New Tool) Plastic Model Trailer Kit from Aoshima. This is the 1/2000 Scale HMS Aircraft Carrier Illustrios Plastic Model Kit from the World Navy Series by Aoshima. Suitable for Ages 15 & Older. This is the 1/12 Scale Kawasaki Zephyr Type IV Motorcycle Plastic Model Motorcycle Kit from Aoshima. This is the 1/24 Scale 2016 Toyota 86 GT Limited 2-Door Car Plastic Model Car Kit from Aoshima. This is the 1/12 Scale Kawasaki Z400GP Motorcycle with Custom Parts Plastic Model Motorcycle Kit from Aoshima. This is a 1/24 Scale McLaren F1 GTR 1997 Le Mans 24H Gulf #41 Plastic Model Kit by Aoshima. Suitable for Ages 14 & Older. This is the 1/12 Scale Suzuki GSX400E II 1981 Motorcycle Plastic Model Motorcycle Kit from Aoshima. This is the 1/24 Scale 1979 Toyota E70 Corolla GT/DX 4-Door Car Plastic Model Car Kit from Aoshima. This is a 1/24 Scale DeLorean from Back to the Future II Plastic Model Kit by Aoshima. Suitable for Ages 15 & Older. This is a 1/72 Scale JGSDF Maneuver Combat Vehicle (Proto Type) Plastic Model Kit from Aoshima. Suitable for Ages 15 & Older. This is the 1/100 Scale Pirate Ship Plastic Model Sailing Ship Kit from Aoshima. This is a 1/350 scale Greek Warship 100BC plastic model sailing ship from Aoshima. This is a 1/24 Scale DeLorean from Back to the Future I Plastic Model Kit by Aoshima. Suitable for Ages 15 & Older.